This week is all about BOATS! 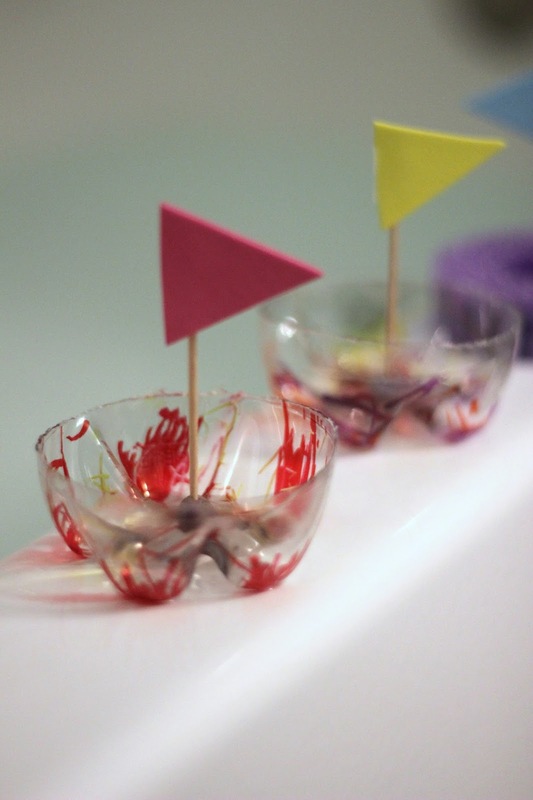 Have you ever made boats with your kids before? Our absolute favorite boats are ice boats! We love to do ice boat races with them too! We've also made banana boats for a snack and they sure were yummy! (This post contains Amazon Affiliate links). This week we are reading Toy Boat by Randall de Seve for our Weekly Virtual Book Club for Kids and creating a boat making station! To create a boat making station you need to first decide what type of boats you want to make and then gather your materials!! We made pool noodle boats and plastic bottle boats this week! For pool noodle boats you need pool noodles, a toothpick, some foam triangles, tape, and Sharpies! For plastic bottle boats you need a plastic bottle, a sharp knife, Sharpies, a toothpick, foam triangles, tape, and scissors. Once we gathered all of our materials then we started creating! 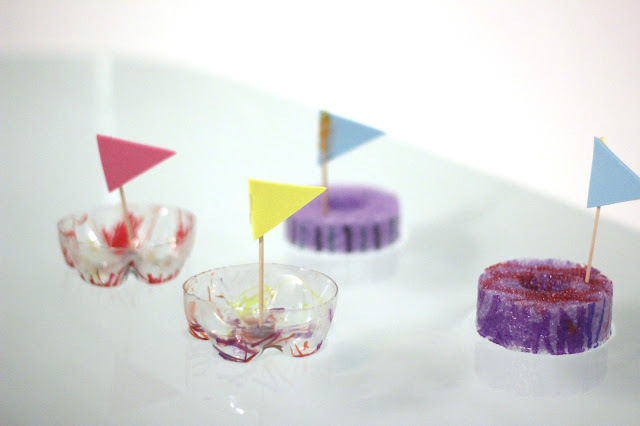 We set up all of the materials on the table so that the kids could make a variety of boats! Adults were in charge of cutting the plastic bottles and pool noodles to make the boat bases. You can find more detailed instructions for soda bottle boats over on The Pinterested Parent. 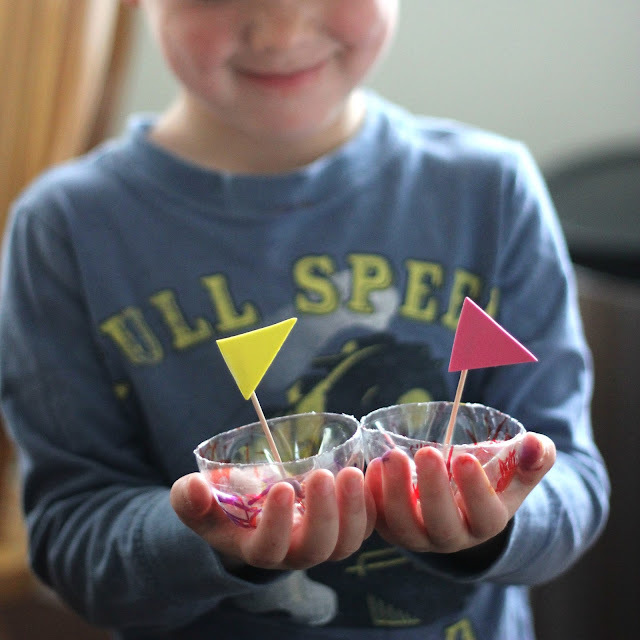 You can find more detailed instructions and pictures for pool noodle boats over on Our Family of Seven. We drew on the plastic bottle pieces and pool noodle pieces with Sharpies so that the colors didn't disappear when the boats went into the water. Once the plastic bottles and pool noodle pieces were all decorated, we stuck toothpicks in them and taped foam sails on them and we were ready to launch the boats! We filled up the bathtub for our boat launch since it is raining a bunch outside this week! The kids had fun racing the boats by blowing them! It was fun to see which boats went faster and the kids had a good time experimenting to see what happens when the boats tip over. We learned about capsizing and what happens when the "wind" blows the boats too fast! 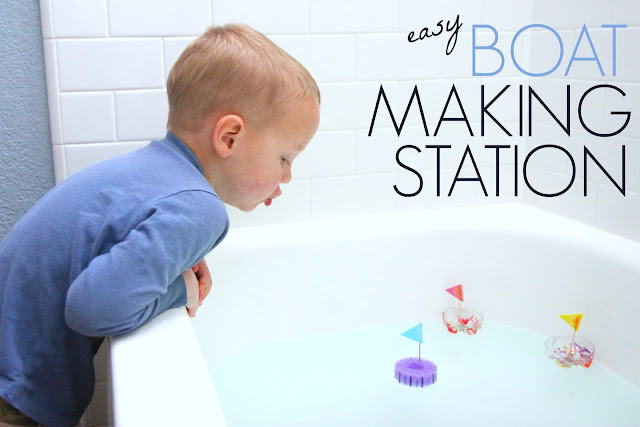 This was such an easy activity to set up and kept my preschooler busy for awhile! 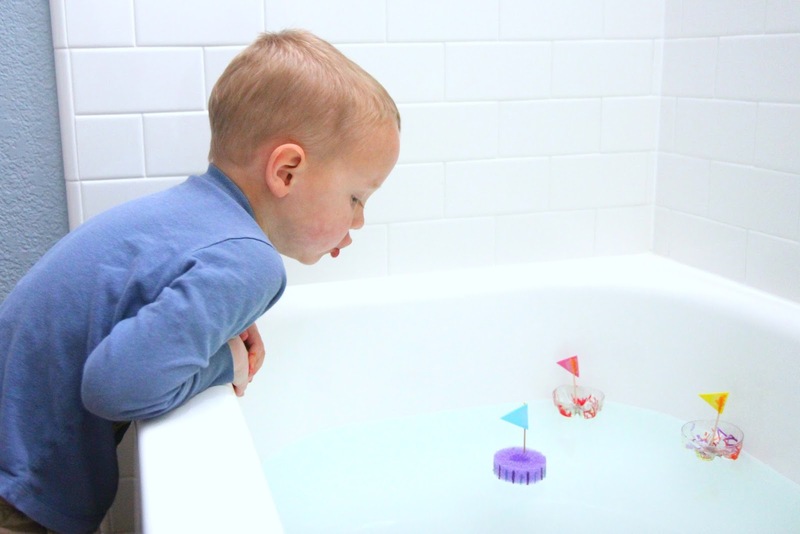 He got soaked playing with the boats by the bathtub! Please note that if your child is by a bathtub full of water you need to be nearby monitoring your child! This isn't an independent activity! 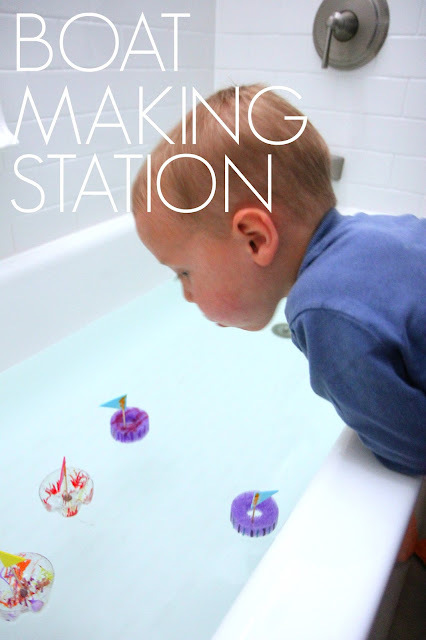 After exploring and creating boats, it is so fun to read Toy Boat by Randall de Seve and check out all of the other boat themed activities created by our VBC Co-hosts this week! Scroll down and click on the links to see what everyone came up with this week! Don't forget to join our Weekly VBC Facebook group to find more ideas for Boat week as well!